On the second day of the event (the first day is covered in Part One), attendees were treated to quite a different demo: a chance to listen to the new version of the Sonus faber Aida loudspeaker driven by Audio Research electronics. This Aida model, which premiered at the Warsaw Audio Video Show in November 2017, represents a complete internal—that is, acoustic—overhaul of the original model, which was released in 2011, though it essentially retains its predecessor’s enclosure design. Although the flagship Sonus faber Aida comes in at the same $130k price as the new top-tier McIntosh XRT2.1K tower floorstander (described in Part One), these two statement transducers from two divergent brands could hardly differ more in overall design (point-source versus line source), sound, style, scale, and materials. The Sonus faber loudspeakers are lovingly handcrafted in Vicenza, Italy, a town renowned for its extensive history in the woodworking arts, including the world-famous musical instruments made by its highly skilled luthiers. In keeping with traditional woodworking techniques Sonus faber is known not only for its gorgeously crafted and hand-finished enclosures, but also for the fine acoustical qualities/properties associated with string instruments made from wood. Fittingly the new Aida’s designers—Chief Design Officer Livio Cucuzza and Chief Acoustic Engineer Paolo Tezzon—view the speaker as a musical instrument. (Tezzon also says not to call him an audiophile; he considers himself a music lover first and foremost.) However, changing all the loudspeaker’s insides while retaining the original Aida enclosure’s dimensions proved challenging, said Tezzon. Sonus faber’s lyre-shaped cabinet is made of cross-grained African okoumè plywood, two inches in total thickness. In addition to its sonic sweetness, it’s lovely to look at. The speaker features a host of new structural and acoustic technologies as well as updated Sonus faber drivers and new chambers for them. Oddly enough, the Aida is a three-and-two-thirds-way design. Yes, you read that correctly. (As an aside, this atypical array brought to mind my old Volvo 850 that had a five-cylinder engine—not the usual four or six.) This unusual configuration refers to the group of three bass units (two woofers and an infra-subwoofer, all made with nano-carbon-fiber-sandwich diaphragms), each in its own chamber, that are run in parallel; to help “stagger” the low-end frequencies each woofer is progressively “cut down” (rolled-off), with only the woofer closest to the midrange crossing over to the midrange. Another tech advance is Sonus faber’s patented Stealth Reflex System, including a laminar duct that helps regulate air-flow speed, allowing for deeper bass extension than in conventional ported speakers. The new Aria also employs Sonus faber’s Sound Field Shaper technology, comprising rear-facing drivers that deepen the soundstage and give the impression of a more omnidirectional presentation. The tweeter has been upgraded to the latest D.A.D. (Damped Apex Dome) Arrow Point, also found in the company’s Lilium floorstander and Homage Tradition Collection speakers. The updated bow-spring suspension contains SF’s Zero Vibration Transmission technology, which helps reduce vibration and spurious resonances from floors, walls, etc. Attendees were scheduled for demo listening in a mid-sized living room on an upper floor at the townhouse. 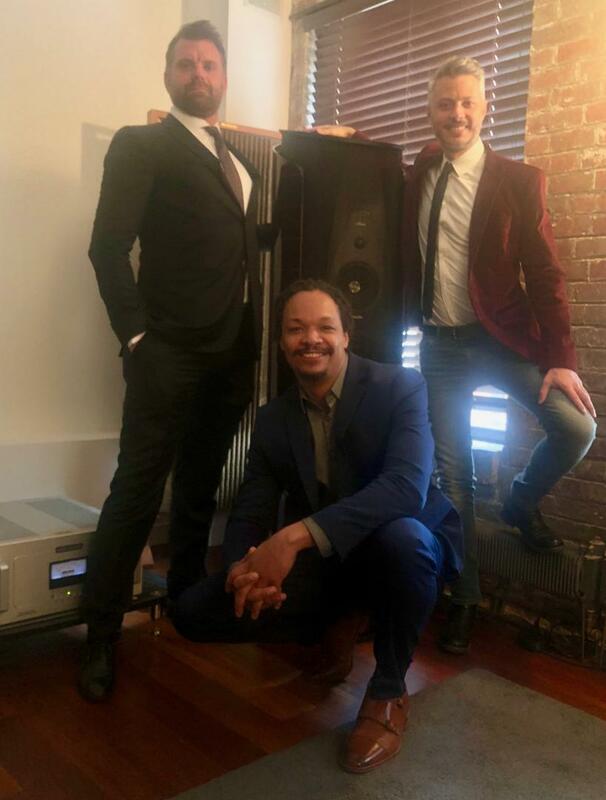 From a prior visit I’d remembered Sonus faber’s North American Brand Manager Will Kline’s knack for curating wonderfully eclectic and diverse musical fare. Once again he did not disappoint. On tap first for our Aida demo was a lively jazzy rendition of The Police’s “Walking on the Moon” by the Yuri Honing Trio. Rapid-fire transient attacks and long decays were the order of the day. The smooth, sensual tones of the closely miked, breathy sax emerged from silent backgrounds. On “Black Night” the sense of texture and body on Doug McCloud’s guitar heightened the expressiveness of his blues licks to great effect. 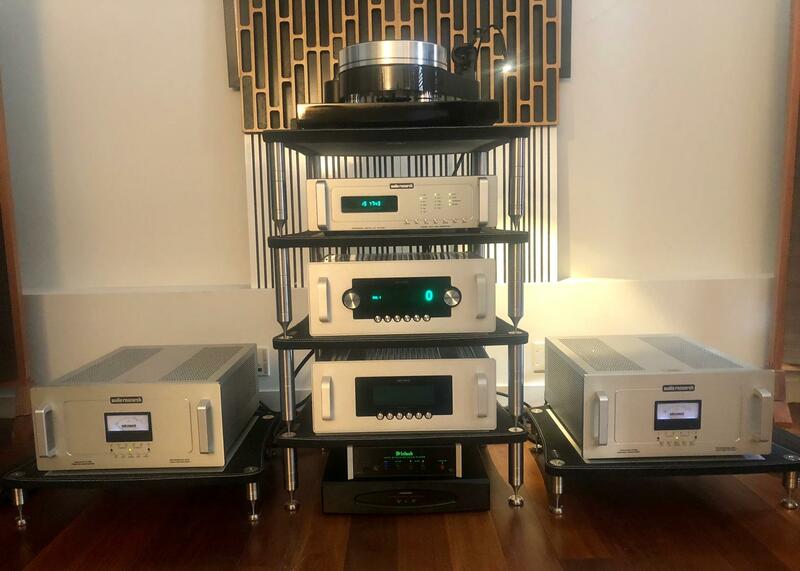 We only listened to digital sources—Red Book CDs mostly, played back on an Audio Research Reference Model CD9 player—but the Aida driven by the Audio Research REF 6 stereo preamplifier and 250 SE monoblock tube amps elevated the format far beyond “standard” playback. Granted I didn’t get to spend nearly as much time listening to this system as I did to the McIntosh XRT2.1K speakers, so I can offer only my initial impressions: What struck me most about the new Aida was that it sounded, less, well Sonus-faber-like in certain ways. Although I have not heard the original Aida, I’ve listened to a number of the company’s other speakers at audio shows over the years (as well as at the WOM townhouse) and broadly speaking, have come to associate the brand with a richness balanced with detail, a slight deepening of timbre and tone color (depending on source and electronics), and musicality over stark realism. 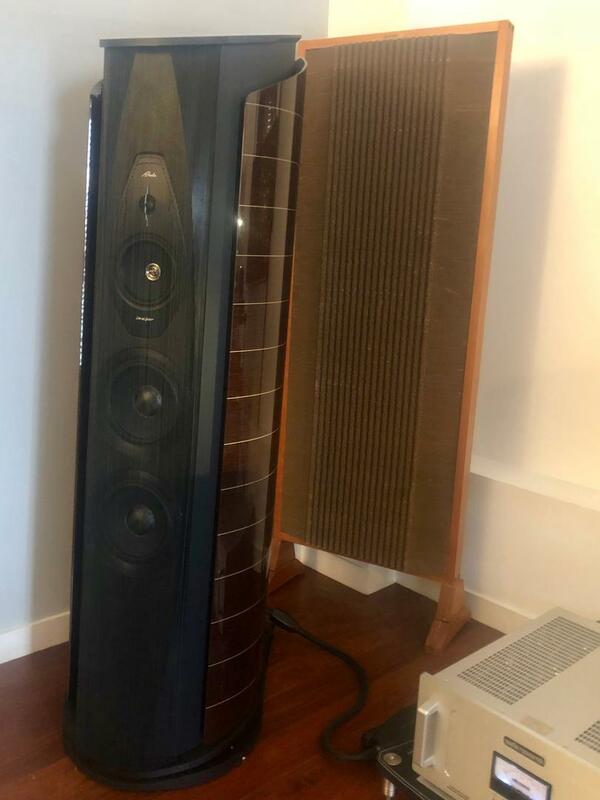 While the Aida didn’t wear its Sonus faber heart on its sleeve, that’s not to say it didn’t express the emotion and musicality I associate with the marque—it certainly did and more. It was extremely musical and immersive (even more so in this smaller room), and delivered highly resolved detail, but oh, how the speaker opened up with a sense of natural airiness I’d never have expected! The Aidas damn nearly disappeared at times too. Backgrounds were silent, and images were focused and specific—as if you were sitting within the first few rows at a concert in an intimate venue. The vivid presentation seemed to have a forward emphasis with almost Technicolor-like vibrancy. In short, the system performed its job of letting the (well-recorded) music shine through as unimpeded as the afternoon sun in that room (glimpsed in the photo below), with a highly resolved sense of body and life.